For Sale : 1995 Toyota Supra Low Low Price!!! 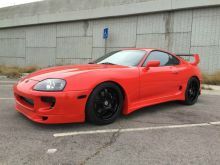 Up for sale is a Super Nice Toyota Supra.The paint is as close to flawless as you can get. No dings or scratches on the entire car. This is an original Twin Turbo Supra with only 70,500 miles on it! It has a clean title with no accident history.